While there are so many exciting parts about starting a new job, one thing that I was really excited about beyond the realm of responsibilities I’d have was transitioning some of my “teacher clothes” to a more corporate business setting. While I am lucky that our dress code is pretty casual (we can wear jeans! ), you see a bit of everything in the office. I will wear jeans occasionally but am reserving a lot of my jean time for when the temperatures get colder, and I want to live in sweaters. 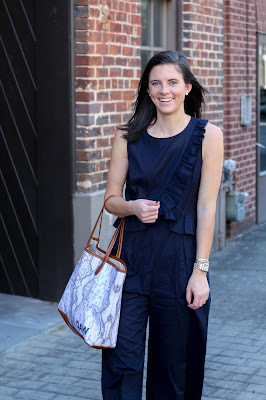 One piece that I added to my closet soon after starting this job was this adorable navy ruffled jumpsuit. You could definitely wear this in a variety of job settings, but there was something about working for a magazine and assisting stylists at photoshoots and running errands among other things that made a jumpsuit the perfect “professional” piece that requires minimum effort that still looks put together and chic. 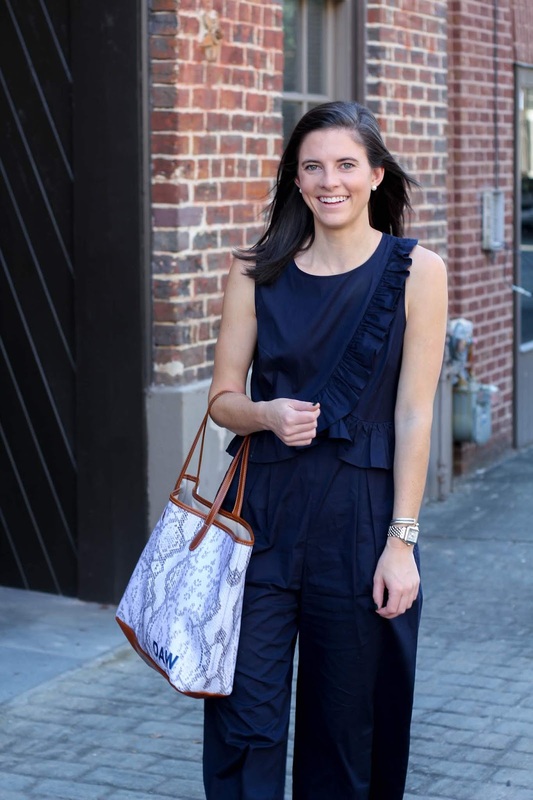 While the jumpsuit certainly makes a statement on its own, with the right accessories, it looks even more put together. If I had to identify one thing in my closet that I may have too many of it would certainly be tote bags. Even knowing that fact doesn’t tend to stop me from adding new ones to my selection. Over the past few years, however, the new ones I’ve found have all been by the same brand, Barrington Gifts. If you’ve been reading my blog for a while, then this is probably not the first time you’ve heard me talk about this brand. 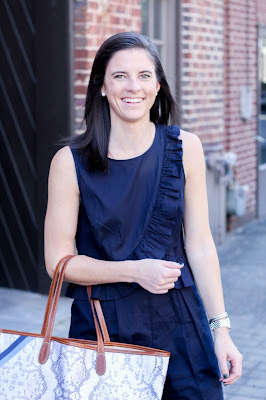 Their St. Anne Tote has been my go-to since early on in my college career. So much so, that this is my 4th pattern in this timeless style. 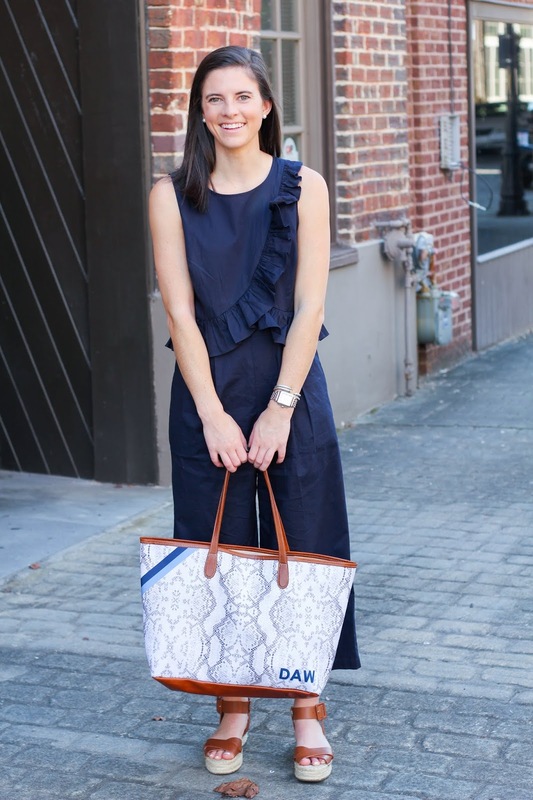 What’s so tempting about Barrington and discovering a style that you love so much is that there are countless pattern and monogram combinations that make it so challenging to decide on just one. With my love of navy and light blue, I loved that I could combine the new monogram and stripe style with their python pattern for a bag that pairs perfectly with brown or black and across multiple seasons. Aside from the cute exteriors of this tote, the functionality of it is what keeps me coming back. I used to have to carry so much more in it but lessened that a bit now that I don’t have to take my laptop to work. I have included my case and laptop in the picture since I thought it may be helpful to show how I like to keep it all orderly when everything is inside. My biggest tip when it comes to organizing your work tote is finding one that has pockets and/or using pouches to ensure that everything has a place. I like using this combo because it helps me to ensure that my bag doesn’t become a catch-all for random things I know that I don’t need. 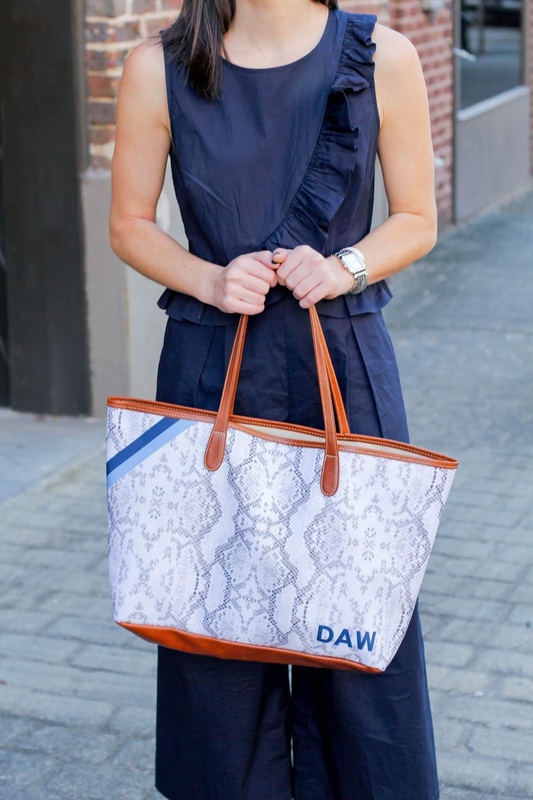 The large zipper pocket in the St. Anne Tote is perfect for your laptop charger to help keep it from getting tangled. In the three front pockets, I like to keep my headphones, blue-light glasses, and store my Barrington Gift ID Key Ring so that they are easy to locate when it comes time to leave the office at the end of the day. In the main part of the tote I like to keep my planner (sometimes both my blog one from Sweet Caroline Designs and my everyday one by Day Designer), my laptop in its case, as well as writing utensils. Since I don’t like having to dig for things and would hate for a pen to explode in my bag, I like to keep my pens in a pencil pouch by Truffle (they have the best small organizer pouches). Lastly, I have another pouch in the main part of my bag with a hairbrush, Chapstick, and other little miscellaneous items. Because everything is in its spot, it isn’t a chore to pack or unpack my bag which is the last thing I’d want to deal with after a long day at work. 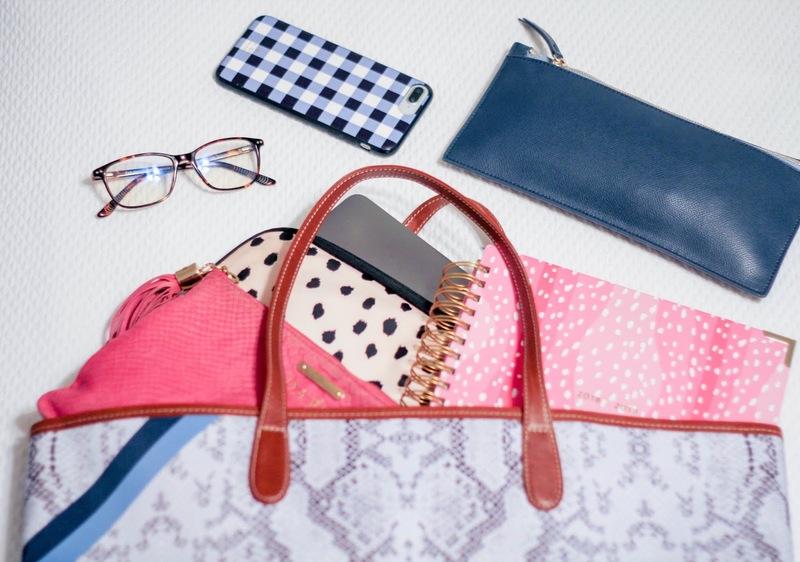 I'd love to hear any of the tips you may have when it comes to keeping your work tote organized! This is definitely the perfect chic outfit that I can picture you wearing working in Bham at a magazine! 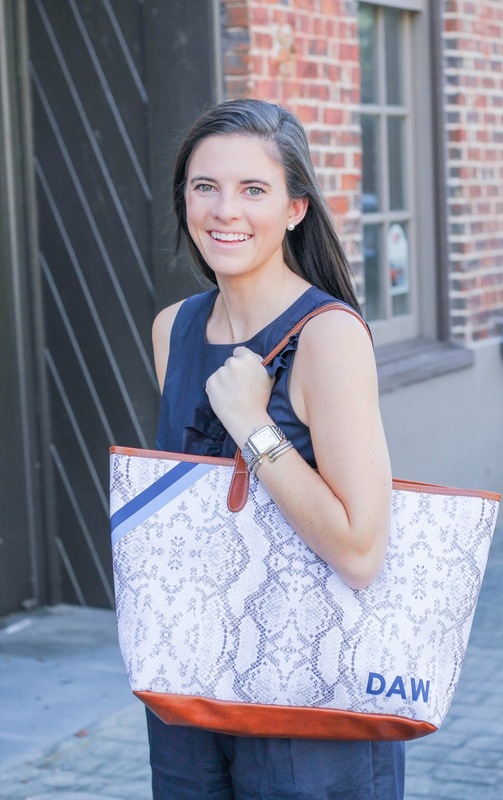 Love the print on your tote!